The subject of discussion is dedicated to the issue of sustainable development of TRACECA and plan of activities in view of the new priorities of TRACECA regarding the transformation info international organization. Mr. Ciopraga has briefed Mr. Pyvovarskyi about his intention to receive comments and proposals from each of TRACECA member-country. Parties of the meeting exchanged ideas and underlined the necessity of ensuring legal support for the Working Group meeting on TRACECA new status as international organization. 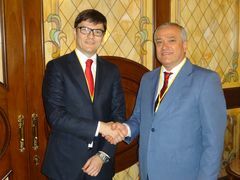 During the meeting Mr. Ciopraga and Mr. Pivovarskyi underlined the significance and urgency for Ukraine and for the TRACECA member states the continuation of the regional EU technical assistance projects attracting experts from such organizations as Maritime Safety Agency (EMSA), subject to the country’s needs. Mr. Ciopraga stressed that following his last visit to Ukraine and meeting with Mrs. Oksana Reuter, Deputy Minister of Infrastructure for European Integration he expects the suggestions of the Ukrainian Party regarding the implementation of technical projects in the field of railway, maritime and road transport as well as comments of TRACECA reorganization.